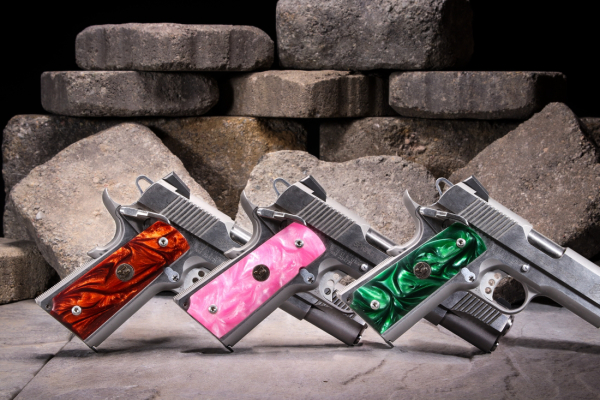 Lyman Products, Middletown, CT- - Pachmayr– a leader in Handgun grips, recoil reduction, and gunsmithing – introduces the Custom Series Pearly Pistol Grips, the ultimate custom look for the 1911. Pachmayr’s new Custom Series Pearl Pistol Grips, as well as all Lyman products and brands, are available nationally through firearms and sporting goods dealers and mail order companies. TacStar, Trius Traps, A-Zoom Precision Snap Caps, Butch’s Gun Care and Targdots are also Lyman brands. Lyman Products has continued to be a leader in developing innovative products for reloaders and shooters for 140 years. Lyman’s reloading kits, presses and dies have provided reloaders with all the high-quality equipment they need to start reloading. Pachmayr, TacStar, Trius Traps, A-Zoom Precision Snap Caps, Butch’s Gun Care and Targdots are all under the Lyman brand. For more information please visit us at lymanproducts.com. Connect with Lyman Products on Facebook at Facebook.com/lymanproducts and follow us on Instagram @LymanProducts.